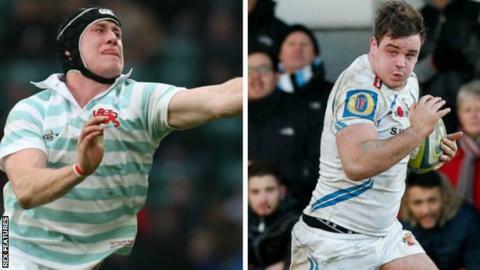 London Irish have signed second-row forwards Ian Nagle and Jerry Sexton on deals until the end of the season. Former Munster and Newcastle player Nagle, 27, will combine playing with his studies at Cambridge University. He represented the Light Blues in December's Varsity Match at Twickenham, in a team which included Harlequins and Wales centre Jamie Roberts. Sexton, 23, is the younger brother of Ireland fly-half Johnny and arrives on loan from Exeter Chiefs. London Irish, currently bottom of the Premiership, are already without second rows George Skivington, Eoin Sheriff and Nic Rouse because of long-term injuries. "Ian and Jerry come into our squad to help ease the pressure," head coach Tom Coventry told BBC Sport. "They're both good men with good experience of playing for clubs in the Premiership." Nagle, who was named man of the match when Munster beat Australia in November 2010, is set to return to Ireland and join Leinster at the end of the season.